Bluddtoof here with an update on our progress with our narrative campaign; both Doc and myself have had pretty busy lives over the last year so we had to suspend activity in this area for a while. We're both busy beavering away at the models we want for the next planned mission; "Airfield Assault" however with the code boys having a geeky get together this next weekend to play as much 8th ed as we can fit into 1 day, Doc and I decided to take a second day (as we're in the same place) and advance the Cypra story a bit! Alas we're neither of us ready for the airfield mission (still got some scenery to make and a model of 20 to paint!!) so we had a chat and I set to work writing a side mission we could play. I looked at the last mission write up and decided to hang it off an element of that, we'll be playing the story of an Imperial strike on an apparent marshalling area for Ork forces in the area, with the intent of stopping the immediate Ork threat. During mission 3; “Running the Gorklet” the Imperial recon forces saw signs of increasing Ork activity near the edges of the swamplands; a great many trails leading off into the dense jungle and swamp. One notably alert ratling reported a huge plume of dust and dense oily black smoke rising out of a deep valley, barely glimpsed through the jungle walls as the convoy fled at breakneck speed for safety. Imperial cogitators have analysed the reports and correlated other data and determined that the Orks are not merely a newly appeared colony as seen on countless worlds within known space, but are in fact well established and technologically developed, far more so than should be possible if the colony originates here on The Forgotten Hole. Reports show that the Orks are massing in the swamp, presumably for a major offensive! Analysis leads the Imperial commanders to believe that the Ork presence must originate off planet and immediately order sensor sweeps of the Cypra System and order all forces to full alert. Meanwhile the Dicers plan a strike on this newly identified mass of Ork activity whilst simultaneously planning a lightning strike on the Ork airfield identified by the recon force. The target is a huge Stompa! The monstrous machine is incomplete and unpowered but if mobilised has the potential to obliterate the poorly equipped Dicers here on the planet. It must be destroyed at all costs! The construction yards are bustling with activity as Ork forces move in from the surrounding areas to prepare for the awakening of the Stompa and the launch of a massive assault on the Guard HQ. NB. The Stompa does not activate during this mission. 100 power lists. No requirement for battle forged but stratagems are available. He's looking a bit dated now; I built him a great many years ago, still cool though! We'll be playing in the same way as we have throughout the campaign; that's to say we're not too bothered by hard and fast rules, rule of cool wins! and if something goes awry then we'll have a chat and change what needs changing. It's a really good way to play. We'll be having a good read of the narrative play section of the 8th rule book too. There are several posts about the campaign on the page, a few can be found using "The Cypra Incident" picture at the top left of the blog page. Stay tuned for the mission write up next week! Fire from the Skies!! Showcase.. Ork Burna Bommer......and another project sneaks into the queue. Picture heavy! Bluddtoof ere wiv gud nooz for youz boyz. Not so gud for dem Beakies tho! 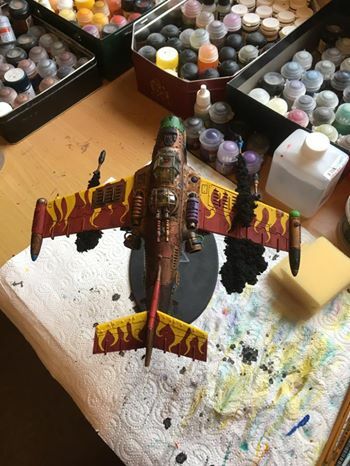 I've finally finished my Burna Bommer so I'm a bit closer to being ready for the next mission in The Cypra Incident; our narrative campaign, which has been on a bit of a hiatus recently due to life getting in the way for both Doc and myself. I also wanted to get it done ready for my first delve into 8th which is happening in a couple of weeks with the code boys. I'm pleased, looks good in the cabinets next to the rest of waagghhh!!!!!!!! Bluddtoof. So then the plan was to jump back to the Imperial Knight, however with Doc mentioning getting ready for Cypra; I decided to revisit the plans we'd made for the next mission and start on the extra bits I'll need for that, namely; some Mek Gunz and a 3rd flyer for starters, then I need to make a bit of scenery for the airfield which will be the setting. So that'll be me busy for a while, I still plan to finish the knight before xmas though. Here's some wip of the Mek gunz build, Doc donated the track sections from his Taurox and there's an extremely old metal gun carriage with what was either a Traktor kannon or Smasha gun from the 90's I think, either way it will find itself re purposed into a modern mek gun. My first model is my take on a bubble chukka, then I'll do 1 of each of the other types. Quick post tonight to highlight our blog facebook page. Increasingly code40k members are sharing wip and showcase's through this medium but also interacting with events and local stores. Hopefully this has peaked your interest and you will pop over take a look and gives us a like!